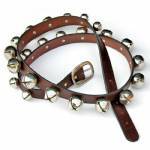 This bell strap is ornamented with 24 silver- or gold-tone jingle bells in three sizes. The bells, ranging from 1" to 1 1/2" diameter, are arranged on the strap so the largest bells are in the middle and the smallest are at each end. The buckle matches the bell color.The unbuckled strap is about 5 feet 3 inches long overall. The buckled length ranges from 4 feet 7 inches to 5 feet 0 inches. This strap is long enough to be be buckled around the neck or collar of a draft horse or around the body of a pony. A tall Santa may enjoy buckling this strap into a loop and wearing it over a shoulder. 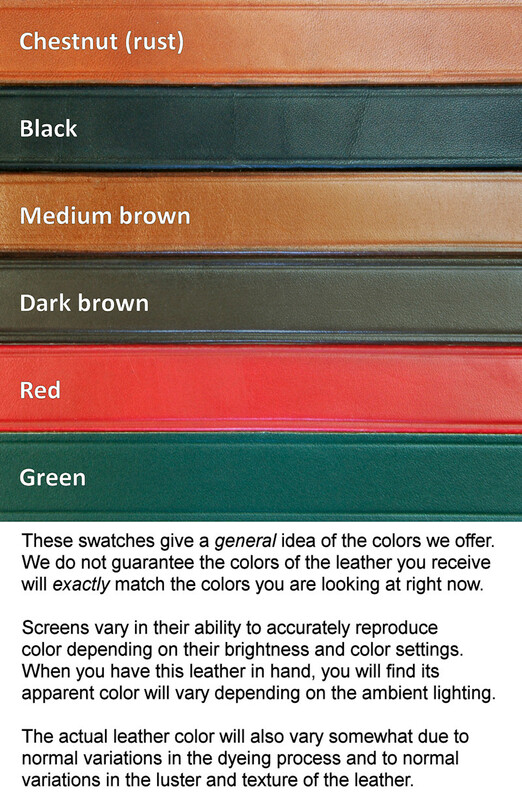 The strap is cut from 1 1/2" wide firm, high quality leather. (Similar straps sold by others are typically only 1" wide.) The edges of each strap are hand dyed and decoratively creased.